Running a fully loaded dishwasher may use half the energy and 1/6 less water than doing dishes by hand. Pre-rinsing can waste up to 6,000 gallons of water per household each year. When in use for one hour a gas grill emits approximately 5.6 lbs of carbon dioxide, charcoal emits 11 lbs, and an electric grill doesn’t emit carbon dioxide directly but accounts for 15 lbs during the production and transmission of electricity. The Office of Sustainability would like to wish each of you a Happy Valentine’s Day. This day and every day make sure that you consider the environment in all of your daily activities. 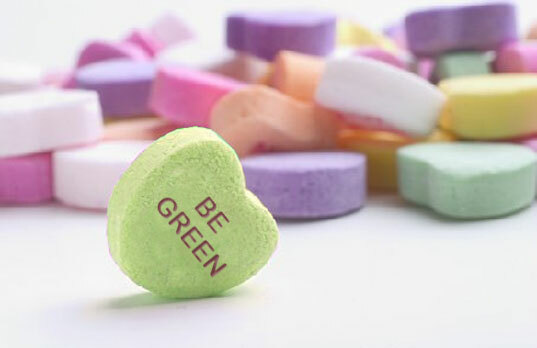 To find out if you’re a green Valentine take this short quiz sponsored by Planet Green. I got 8 out of 10 correct….not bad (considering I did some serious guessing). What’s your score?